Hello friends, At present time most of the mobile manufacturer companies launch budgeted smartphone which comes with different great features and latest technology. Now, the Indian mobile manufacturer company Micromax has introduced his latest Micromax Canvas Juice A177 Smartphone in the Indian market. The Micromax Canvas Juice A177 Smartphone is comes with 5-inch TFT touchscreen which is powered by 1.3GHz Dualcore MediaTek MT6572 processor which is coupled with 1GB RAM. The Micromax Canvas Juice A177 Smartphone is available in Black Color and the estimated Price in of this smartphone in the Indian market is Rs. 8490 only. A177 Canvas Juice runs on 4.2 Android Jelly Bean. Canvas Juice has Powerful Battery 3000 mAh and 1 GB RAM. Micromax Canvas Juice A177 Powered by MTK 6572 Dual Core 1.2 GHz. It has MediaTek MT6572 chipset with Mali 400 GPU. And this smartphone comes with 1GB RAM With 4GB ROM and user can be expand memory up to 32GB via SD Card. 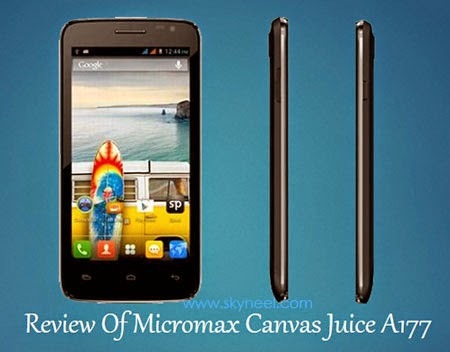 Micromax Canvas Juice comes with FWVGA 5.0-inch touchscreen Display with resolution 854×480 pixels. It has 5 MP Rear Camera with 2592 x 1944 pixels, Auto-focus, LED flash and Front VGA camera. A177 Canvas Juice is a stylish phone, it has 150.5×76.2×10.2 mm, dimensions and phone weight is 101g. Micromax Canvas Juice A177 runs on 4.2 android jelly bean. The Smartphone has a compass, Accelerometer, proximity and Maps, Calendar, Google Search, Gmail, YouTube, Google Talk, Alarm, Calculator, Clock, and other Google sync apps. This is power pack with loaded lots of features and apps. Micromax Canvas Juice support 2G and 3G network and both SIM card slot suport GSM SIM. S Duos has Wi-Fi, Bluetooth, GPRS and EGPRS or EDGE. This smartphone comes with 3000mAh Li-lon battery which provide standby time up to 282hrs and talktime up to 600min. 1. A177 Canvas Juice has good processor and Ram. 2. It has 5.0-inch FWVGA Touchscreen Display. 3. A177 Canvas Juice has long battery backup. 1. A177 Canvas Juice has low resolution Front camera. 2. It doesn’t have batter call quality.